The problem, though, is that we also claim to be historians, e.g., historians of religion — but, defining religion in this way, makes us historians who study the transcendental. And that’s very unhistorial if you ask me. Predictably, you wouldn’t assume model railroad hobbyists or cooking with kiwis to be relevant to everything else human beings do, but that’s not the case with that set of things that goes by the name of religion. That’s why you’d never expect to see, say, “Hair Stylist” appearing beneath a talking head on the TV news, or “Specialist in 16th Century Weaving,” while someone comments on the current US Presidential election. But religion…? It’s supposedly related to everything (Religion and Ecology, Religion and Disability, Religion and the Arts, Religion and…) — which is why some scholars of religion assume that their expertise is continually relevant (and that their scholarly authority is always, well, authoritative and therefore needed). That I don’t happen to think this is the point I tried to make during that lecture; it’s a counter-intuitive point for some. There are limits, in other words, to anything that an historical agent does — after all, I can’t see behind myself there now. And whatever else people think they may be, we’re all at least historical agents and that’s what we have tools to study. Historically-derived tools that are themselves used in historical situations. So inasmuch as my expertise allows me to comment on analogical situations, sure, I might have something useful to say about, say, the principles at play in this or that act of social formation. But just because I study religion doesn’t give me a 360 degree viewpoint and doesn’t necessarily make me worth listening to on — or so I argued up at Lehigh — climate change. Among the things that I remember most about that talk happened during the Q&A, when what looked to me like a student asked me about the risks of the approach that I was advocating — after all, it was an approach that wasn’t interested in a constructive project but, instead, was interested in teaching students skills (e.g., description, comparison, explanation) that they would then use in making whatever it was that they themselves eventually wished to build. Aiming not to inform them what the, for example, good life was, I reasoned that these were the sort of tools they’d likely use in figuring it out for themselves — and then in trying to persuade others to join them in whatever their cause might be. In response, the questioner pointed out that, for instance, understanding how social formation works can be a dangerous things when it falls into the wrong hands (Nazis in 1930s Germany was his example, as I recall) — it’s akin to the tools of a skilled advertizing executive being used for nefarious purposes (which we curiously call propaganda, not advertizing, of course). Or, come to think of it, maybe the tools of Freudian psychology falling into the advertiser’s hands? When you’re in a room filled with people who all think they agree with each other it’s a tough sort of question to answer, for there seems to be a consensus for what the good life is and how to live it. And an indictment comes for anyone not wishing to work toward realizing it, for there’s often a frustration that your critical approach hasn’t taken the eventual step to say what religion really is or how it really ought to be used. But it’s a consensus that quickly breaks down as people starting opening their mouth, for we quickly learn how your interests undermine mine and that my assumptions run counter to yours. Shared goals can sometimes be hard to find. The necessary vagueness of successful political discourse makes this all too evident — for if we get down to specifics we’ll never build the sort of broad coalitions that we need in order to win. So we’re left with Hope or Make American Great Again. Unpledged delegates [superdelegates] exist really to make sure that party leaders and elected officials don’t have to be in a position where they are running against grassroots activists. We could add the electoral college to the list of long-etablished techniques for mitigating against the grassroots rising up, no? And what of gerrymandering districts…? And what of the ideal of “representative” democracy…. But the risk (or should I now call it a challenge?) of democracy that these institutions prevent us from considering all that much is seeing others’ interests as no less driving them than your own. And to me, if I can borrow a line from current protest rallies, that’s precisely what democracy looks like: people with whom you disagree using the same socially formative techniques as you but to rally others from your cause to theirs. That’s the soup, it seems to me, that we’re all in. The challenge of democracy, then, is in taking others seriously in their commitments and passions — and trying to persuade them all the same. 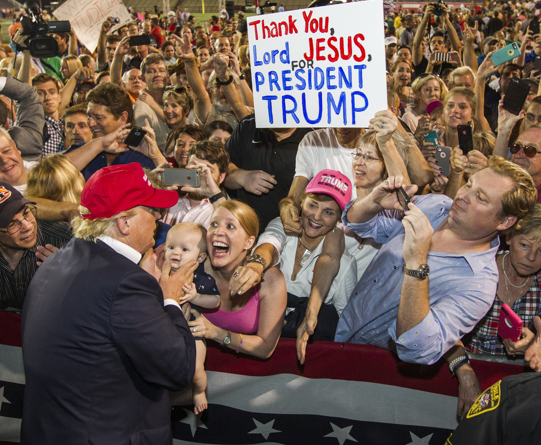 It is the challenge present to the left-leaning voter, not to dismiss those people, pictured above, who came out to see Trump in Alabama not long ago. It’s the challenge to the right-leaning voter not to call Sanders a socialist and right him off. And so while I have no idea how someone else ought to vote, or what society ought to look like, in my role as a professor in a public university I do assume that to figure this ought our students will need to be able to take others seriously as they work to describe, compare, and explain — minimal tools that human beings likely require to make their way around a crowded place (whether an actual market or the marketplace of ideas). These are tools that we know something about in the study of religion, like many other fields, and it’s what I try to teach my students. How such tools are used once they leave my class, and toward which ends, well, I’m not so sure we know all that much about that, at least in our roles as professors. As citizens ourselves, sure, I bet we have some pretty strong views on that — views on what we’d like society to look like and on what the good life should be. But not what it ought to be. I have no idea about that one (though, like you, I probably try my best to dress up my preferences as if they had normative self-evidency — and, come to think of it, maybe that’s what scholars do when they put their academic credentials to work in support of such preferences….). But being a scholar who takes history seriously — i.e., people’s inevitably situated circumstances, including our own — strikes me as requiring us to know our limits, i.e., knowing when we can, and when we cannot, credibly speak with the authority that our degrees and CVs may create for us. And as for citizens who take democracy seriously, well, I’d hope that they’d see the good in us knowing our limits. This entry was posted in Faculty Blog, Relevance of Humanities, Religion in Culture and tagged Advertizing, Authority, Comparison, Definition of Religion, Description, Explanation, Humanities, Lehigh University, Politics, Public Intellectuals, Relevance by Russell McCutcheon. Bookmark the permalink.